I'd like to receive future marketing emails from Cellular Solutions.View terms and conditions. BT Openreach, provider of telecommunications to around 27 million UK homes and businesses, has announced plans to stop selling ISDN services by 2020, and phase out the network entirely by 2025. Though an aging technology, it is estimated around eight million UK businesses still use telephone lines via ISDN, so will need to upgrade before then to be sure their service is not interrupted. With this in mind, BT Openreach has given businesses plenty of time to manage the switch over, but business owners should consider moving well ahead of 2025. What is ISDN – and why are BT switching it off? ‘Integrated Services Digital Network’, or ISDN, has been utilised by BT Openreach since 1986, and has long been the number one standard in telecommunications, providing both voice and internet over a single line, with at one time the fastest internet access available at 128kbps. Connectivity solutions have since advanced rapidly, most notably with superfast internet connections such as fibre lines and high-speed broadband enabling the use of newer technologies such as VoIP or SIP. Read more about our VoIP, or SIP offerings here. Voice over Internet Protocol, or VoIP, is a technology which transmits telephone calls over an IP network, usually the internet. 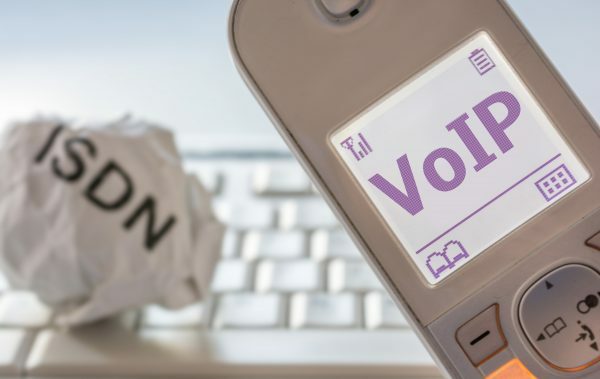 Whereas the outgoing ISDN technology relies on a physical analogue connection between two phone lines, VoIP is entirely digital. The audio is recorded, encoded into a digital signal, and sent over the internet like any other internet data. It is received by the recipient, and decoded back into sound. This has only been possible since the growth of high-speed internet connections, and has signalled the end of physical connections needing to be made to connect a call. SIP trunking is an extension of VoIP which allows VoIP calls to be easily made outside of an organisation’s network, and simplifies the process for making outgoing calls. How is VoIP/SIP better than ISDN? Cost: ISDN technology is traditionally more expensive, especially the high cost of equipment rental. VoIP systems tend to have lower costs, both in terms of rental cost, and overall cost per minute of calls. Uptime: Faults with ISDN lines are often slow to fix. With VoIP telephony, faults can typically be diagnosed and repaired much more quickly. Additionally, installation is usually much more rapid and convenient to the customer, given that physical lines do not need to be laid. Convenience/Portability: Some businesses and geographical locations can be limited in the quantity of local numbers they can have with ISDN. VoIP/SIP has no such limits and best of all, the numbers are usually portable, so wherever in the world your business decides to go, you can keep your number(s). Scalability: New numbers can be added easily, meaning as your business needs change, your telephony can adapt and scale at the same rate much more easily than it could with ISDN. What does my business need to do? Plan ahead and future-proof. In short, if your business hasn’t migrated away from ISDN by 2025, you’ll be left without a landline phone line. If you’re setting up a new business, or moving office soon, consider your telephony options from the outset, and make sure you choose VoIP or SIP from day one to avoid having to switch over and incur additional cost at a later date. Luckily, setting up or migrating to VoIP is relatively straightforward for most businesses, so there’s no need to wait until 2025. If you want to make the switch away from ISDN well ahead of then, contact us to discuss how we can manage your businesses transition to a VoIP or SIP network, and start reaping the rewards today. We can manage everything from moving your lines, your numbers and your hardware to VoIP or SIP, from installation, user training, through to on-going support. We will help you achieve increased growth through better, more efficient communications. We provide phone systems, mobile handsets, mobile phone packages, business landlines, business broadband, digital solutions and more. We will support you in operating more efficiently, effectively and productively. The systems we offer include finance software, CRM software, business intelligence systems, people software and a range of sector-focused solutions. © Copyright Cellular Solutions 2019.